Hollidaysburg is home to some pretty cool surprises. 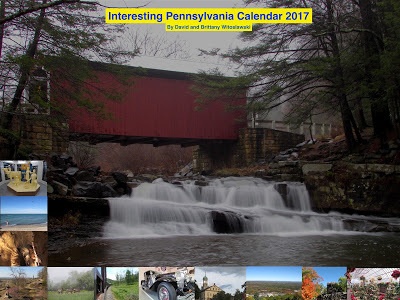 The borough is a museum of sorts for 19th and early 20th century transportation history, with remnants ranging from the Pennsylvania Canal, to the Pennsylvania Railroad, to the start of the automobile age with Route 22/William Penn Highway. Not only does this history remain in the borough, it is recognized, memorialized, and celebrated by the people of the borough, with the creation of community parks and more. Today we will look at three points of interest in Hollidaysburg, the geological wonder of Chimney Rocks, a memorial to some ruins of the Pennsylvania Canal at Canal Basin Park, and some old rail infrastructure. Hollidaysburg has erected a park in honor of one of the coolest geologic wonders in Blair County, Chimney Rocks. Included at the park are some wild vertical rock features that offer breathtaking views of the Juniata Valley and Hollidaysburg. At the lowest point in the park you can see this iron furnace that dates back to circa 1836. Chimney Rocks Park has multiple levels to make observations from. It has multiple hikes that are in the half mile length range with some fun elevation changes. The lower observation area is completely flat, for those of you who do not want to do any hiking. That level also has picnic area and a playground. One of the limestone formations from which Chimney Rocks was named after. The trail itself, while steep, is not challenging for an average hiker. At roughly half a mile, tops, this is a great place to stretch your legs out and to satisfy yourself with a little bit of hiking. Here is a view looking up towards Chimney Rocks, from within the grove and playground area of this small park. The community did a great job creating a place where everyone can enjoy this geologic beauty. Here is a view from the lower overlook, easily accessible to everyone with a level walkway out to it from the parking area. The lower area also has a nicely wooded hiking trail that makes a loop to the top. Just down the street from here is an ode to a manmade wonder that once traversed these rugged lands, Canal Basin Park. Canal Basin Park is a special place that Hollidaysburg has created to preserve one of the last intact sections of the Pennsylvania Canal. The canal once ran from Philadelphia to Pittsburgh, and beyond, with a canal system. From here, the canal hooked up with the Allegheny Portage Railroad, which took the canal boats by rail and a series of funiculars up and over the Allegheny Front to Johnstown, where the canal picked up once again. On a side note, the reservoir that was used to power the canal in Johnstown was abandoned once the Pennsylvania Railroad purchased the right-of-way, and subsequent owners of the reservoir in South Fork were negligent, leading to the failure of the dam and the horrific tragedy of the 1889 Johnstown Flood. The park features a bridge built to resemble one of the old canal crossings, a working lock and dam, an amphitheater, and the historic Reiser House. This park serves as the beginning of the Allegheny Portage Railroad attractions, showing the path of the old Allegheny Portage Railroad of the Pennsylvania Canal. More old transportation infrastructure exists further down the street at the former Pennsylvania Railroad Depot railyard. This serves as the hub for the Everett Railroad, an excursion train that runs on the old line. They have lots of old rolling stock, with some in the process of being restored. It is great to see this kind of work happening to preserve our heritage. They do a great job in this area of preserving our past in this manner. Hollidaysburg is a pretty cool place, especially if you love geologic wonders, hiking, scenic overlooks, canal history, and rail history. This is an often overlooked place that you should definitely check out.